Local Mums pledged to take on Surrey County Council�as�owners of the small, family-run business�Heritage Farm Nurseries,�Jonathan and Fiona Daniels, struggled to relocate their family home and four children rather than face eviction or 167% increase in rent. Heritage Farm Nurseries�which houses an aquatic centre, an indoor and outdoor play and picnic area with Thomas the Tank Engine train tracks and a family-friendly cafe, is a much-loved haven for local families and enormously popular with local children. 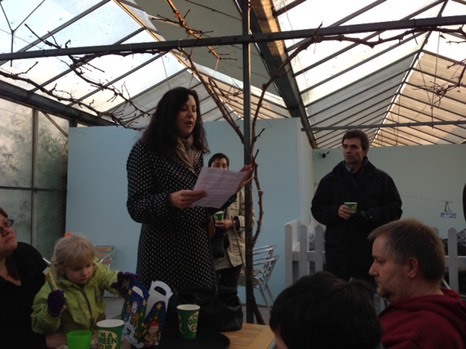 After a social media campaign to highlight the plight of the much-loved local family business, hundreds of local residents packed the cafe at�Heritage Farm Nurseries�in Wallington on Sunday to discuss steps to saving the threatened local attraction. "We are devastated by the news that�Heritage Farm Nurseries�has been forced to close," said Kathy McGuinness, who runs the local support network for mums, Local Mums Online. "Heritage Farm Nurseries�is so popular among our members as a place to bring our children. Some of our members reported that their children had burst into tears when we told them the news that�Heritage Farm Nurseries�is closing." "For so many children growing up in an urban environment on the outskirts of London, this is a quiet haven in the middle of the countryside - an escape from the confines of their every-day life, school, television, computer games and their own four walls," continued Kathy. The Daniels' family are being threatened by eviction from the premises by�Surrey County Council�unless they pay 167% increase in rent. They have been forced to make 20 members of staff redundant and are in the process of selling all their animals. Local mums warned�Surrey County Council�that it had "a fight on its hands if it thinks it can treat local families with such lack of respect. We say,�Surrey County Council, answer your emails! Show your face! Why are you hiding? Could it be you are ashamed of your actions? Well, you should be." Local MP Tom Brake came to support the meeting on Sunday and told local residents he believes�there is still enough time to convince the council and keep�Heritage Farm Nurseries�open. "The closure of�Heritage Farm Nurseries�will in no way benefit the economy and will force 20 people to lose their jobs," said Tom Brake. "The massive price hike in rent will lead to the land being unoccupied offering no benefit for the council." He urged Local Mums and residents to keep up their campaign and encouraged all the protestors to continue to email�Surrey County Council�and lobby�Surrey County Council�HQ in Kingston if negotiations proved unsuccessful this week. The Deputy Leader of Surrey County Council, Peter Martin, responded in an interview with the BBC on Wednesday that they are open to negotiations. Fiona Daniels replied, "I am livid that Peter Martin has gone on public radio and said this when we have written confirmation from them, in a letter to Tom Brake in December 2012, that there was absolutely no room for negotiation. This is too little, too late for us as we have had to make all our staff redundant, sell off all our stock for very little money and find somewhere else to live." Peter Martin also commented that the council was driving up the rent because the business was acting commercially and its previous rent was subsidised as the council treated it as a farm. "While we applaud Mr Daniels' initiative," said Mr Martin, "We have to ask a reasonable commercial rent, in line with the open market, as Surrey taxpayers cannot be expected to subsidise a successful private business." Jonathan Daniels has responded that he has invested more than �400,000 in the business and the site since it opened in 2004 and highlighted that it is a valued community resource that deserves a better deal. Speaking to BBC Surrey, Kathy McGuinness commented: "I really hope Surrey County Council will reconsider its position and realise how much Heritage Farm benefits the local community.�I don't believe the people that made this decision had any idea how popular Heritage Farm was. We would love to see them take our views on board and allow Heritage Farm to continue doing the fantastic job it was doing for the community. The council would be heroes in our eyes if they were to renegotiate a reasonable deal." "We would be happy for our taxes to subsidise such a fantastic resource for local families," added Local Mum Stephanie Kvam. "How are they helping tax payers by reducing business rate revenues, increasing jobless and potentially having an empty site with zero rent?" Jonathan and Fiona Daniels are currently in negotiations with Surrey County Council with an announcement on the future of Heritage Farm expected early next week. They have been offered free legal advice by Paul Verlander and his firm Carpenter & Co Solicitors after he heard about the story from his partner�Local Mums Online�member Tracy Fitzgerald. "We want so say thank you so much to�Local Mums Online," said Jonathan and Fiona Daniels. "They have done so much for us. If it wasn't for their hard work and dedication the council would not have come back to the table."